TRINCOMALEE, Sri Lanka - U.S. Marines and Sailors of the 11th Marine Expeditionary Unit embarked aboard amphibious transport dock USS Somerset (LPD 25) recently arrived in Trincomalee, Sri Lanka, for a theater security cooperation (TSC) exchange with the Sri Lankan Navy's marine forces, Nov. 23-25. The military exchange will focus on enhancing relationships between the two naval services, and honing basic military skills and small boat operations that could support humanitarian assistance and disaster relief missions. 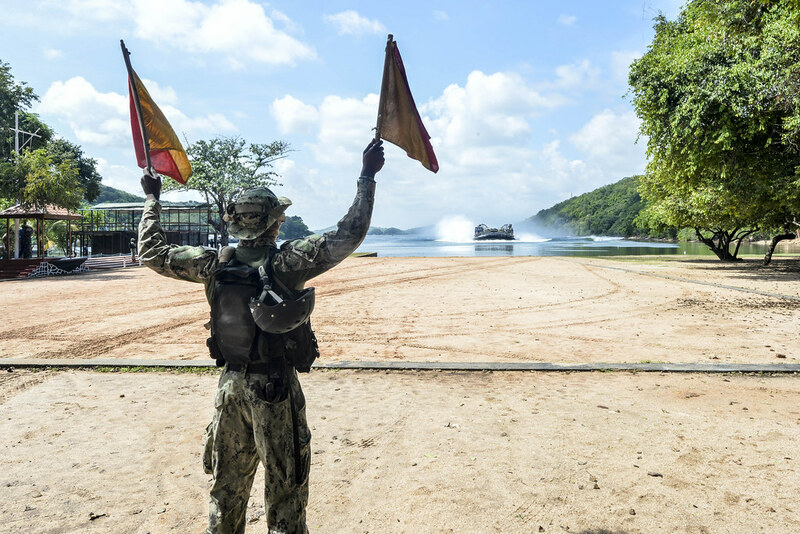 Additionally, the TSC will provide an opportunity for U.S. Marines to pass to their newly-formed counterparts in Sri Lanka the fundamentals of being a marine, and what sets them apart from soldiers or sailors. "We look forward to working alongside the Sri Lankan marines, and sharing the characteristics and ethos of our Marine Corps," said Col. Clay C. Tipton, commanding officer, 11th MEU. "Simply put, U.S. Marines are known for taking care of their own, demonstrating a bias for action, and having an unwavering devotion to mission accomplishment." The TSC training includes basic defensive tactics, combat life-saving skills, explosive ordnance disposal, aircraft familiarization, small boat and convoy operations, and small unit leadership classes. "Any time we can work and train with partner and allied militaries, it lays a foundation for future cooperation," said Capt. Darren Glaser, Somerset's commanding officer. "These engagements build the relationships and trust needed for cooperative responses to regional crises." The Makin Island Amphibious Ready Group/11th MEU units involved are Somerset; Company A, Battalion Landing Team 1st Bn., 4th Marines; UH-1Y Huey and AH-1Z Cobra sections from Marine Medium Tiltrotor Squadron 163 (Reinforced); Combat Logistics Det. 112, Combat Logistics Battalion 11; and a platoon from the Maritime Raid Force. The MKI ARG/11th MEU provides senior U.S. military leadership and coalition partners with a flexible force which can rapidly respond to contingencies and crises within a region. With ships, aircraft, troops, and logistical equipment, the ARG/MEU is a self-contained and self-sustained task force capable of conducting everything from combat operations to providing humanitarian assistance. The MKI ARG/11th MEU arrived in the 7th Fleet area of operations Oct. 29. While in 7th Fleet, the MKI ARG/11th MEU have conducted a series of TSC engagements, like Exercise Keen Sword with Japan and Tiger Strike with Malaysia, to strengthen ties and increase communication and coordination with allies and partners in the region. In addition to Somerset, the MKI ARG includes amphibious assault ship USS Makin Island (LHD 8), and amphibious dock landing ship USS Comstock (LSD 45).